This October we are having out second annual Open Artist Event! Stop by the theatre during open art hours (TBA) and become inspired by the century-old architecture to create an original work of art! Whether you're a photographer, painter, or sculptor this is open to ALL forms of art and all ages! Our panel of judges will choose one artist to win a $200 CASH PRIZE for first place, $100 for second place and $50 for third place!All art will be put on display in the theatre for November's First Friday Art Walk. 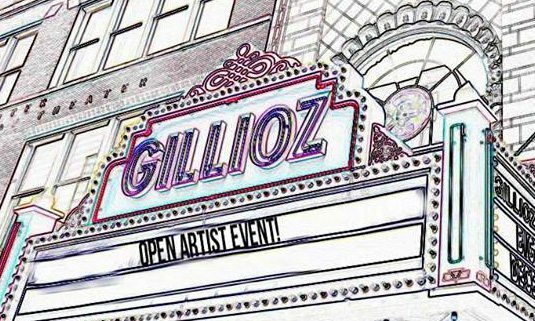 TO ENTER: Turn in your Gillioz inspired artwork to the theatre between October 15th at 10am and October 29th 5pm with your contact information (name, number, email). Artwork cannot be submitted before or after the designated dates. Art that is not relevant or inspired by the Gillioz theatre in some way will NOT be accepted. Artist will only be allowed to freely roam the theatre during the designated hours (TBA). There are no size requirements for any media. Please try to keep your number of entries to 3 or less. Please make sure your art is matted or framed with hardware on the back so that it can be hung on the walls for the art walk. Sculptures and other forms of media can be displayed differently. If your art is not in some way ready to show at an art exhibit we cannot put it on display. Art is due by 5pm Monday, October 29th.